But lay up for yourselves treasures in heaven, where neither moth nor rust doth corrupt, and where thieves do not break through nor steal. 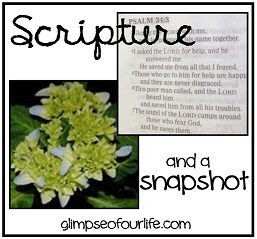 Thank you for joining a glimpse of our life for Scripture & A Snapshot. Leave a comment with a verse that God has placed on your heart this week, or leave a link to your own post sharing a Scripture and a snapshot. Please visit some of the other links, too. What a great way to illustrate that verse! Peace to your house this day, friend! I'm grateful for recently finding your lovely blog. Thanks for allowing us to share here. I love this verse. It's one God had really spoken to me on early on in my faith. Thank you for sharing today. Thank you too for stopping by my site. Interesting picture - and contrast! Thanks for hosting S&S! Thanks for linking to Sunday Stillness.